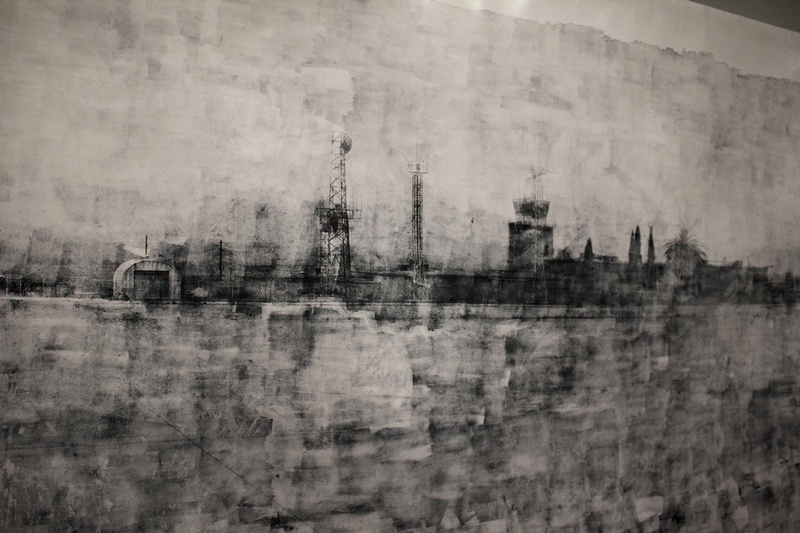 “The Great Picture” is a unique camera obscura black-and-white, gelatin silver, photograph 31 feet high and 107 feet wide. The Smithsonian’s National Air and Space Museum will exhibit “The Great Picture” at its Steven F. Udvar-Hazy Center in Chantilly, Va., beginning this spring. 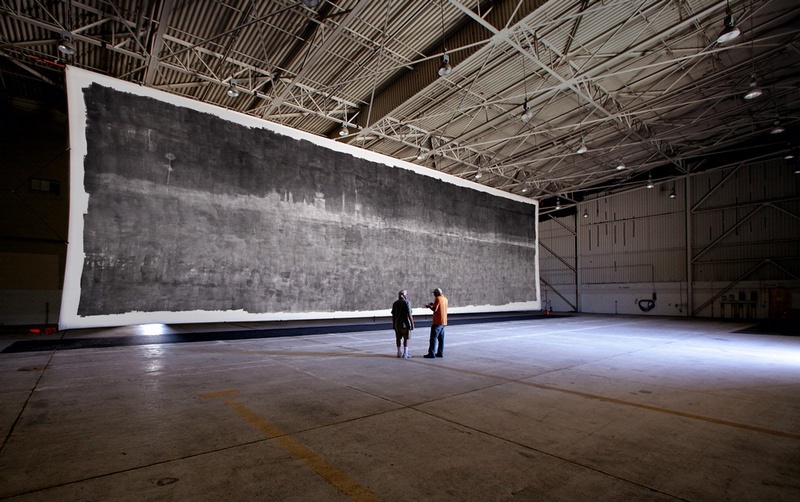 The 3,375-square-foot photograph of an abandoned Marine Corps air station in Southern California was taken by the largest pinhole camera in the world. Visitors can see the photograph from April 26 through November. “The Great Picture” is a unique camera obscura black-and-white, gelatin silver, photograph 31 feet high and 107 feet wide. This single mammoth photograph was created in 2006 by a group of six artists—Jerry Burchfield, Mark Chamberlain, Jacques Garnier, Rob Johnson, Douglas McCulloh, and Clayton Spada—along with hundreds of volunteers. They transformed the abandoned F/A-18 fighter jet hangar into a gigantic pinhole camera by darkening and sealing the interior from outside light. A pinhole just under a quarter-inch in diameter was centered between the metal hangar doors to serve as the camera’s aperture. While this particular pinhole camera was recorded in the Guinness Book of World Records as the world’s largest, the “camera-obscura” technique has been known for more than 2,000 years. Established in 1942, Marine Corps Air Station El Toro in Southern California became the largest Marine air station on the West Coast and headquarters for Marine air operations in the Pacific region during and after World War II. All U.S. presidents in the postwar era landed in Air Force One at El Toro before it was decommissioned in 1999. “The Great Picture” shows the air station’s control tower, other structures and runways, and the San Joaquin Hills in the background. Visitors will have a chance to meet and speak with one of the artists at the Udvar-Hazy Center Saturday, April 26, 1–3 p.m. Jacques Garnier will sign copies of The Great Picture: Making the World’s Largest Photograph, a book that documents the techniques used during this creative process. If you want to take pinhole pictures, you can build one yourself or you can also get a Viddy or a Videre. Viddy is a do-it-yourself pinhole camera kit. Introducing VIDDY, our latest do-it-yourself pinhole camera kit! from The Pop-Up Pinhole Co. on Vimeo. Previous Previous post: Game of Drones. John Bailey ASC on drone safety.